When I was a child in the nineteen-fifties, there was a stigma associated with men crying. Men, as depicted in all my reading books, were married with two children, a boy and a girl, came home at six and enjoyed a nutritious meal of meat and two veg which the wife had prepared, after wringing the laundry through the mangle and dusting the flying ducks on the lounge wall. Boys learned and men knew that crying was an indulgence more suited to women and girls. Well in the bible, it is the norm for men to weep. Jacob does it, Saul and David do it and now, I come to think of it, the leading men of the New Testament do it. Joseph, the great Viceroy of Egypt, does it again and again. Joseph weeps when he hears his brothers speaking among themselves, admitting their guilt; he weeps when he sees Benjamin. When he discloses his true identity to his brothers he weeps so loudly that all the Egyptians in Pharaoh’s house can hear. Then he and Benjamin weep together, and Joseph kisses all his brothers, and weeps. The brothers bring their father Jacob to Egypt so that he can be reunited with Joseph. When Joseph sees Jacob, he falls on his neck and cries a long while, though, as it happens, Jacob does not cry. These words of reassurance are very similar to those which Joseph speaks to his brothers after identifying himself to them: ‘Do not be grieved or angry with yourselves that you sold me, because God sent me before you to preserve life.’ This repetition is an instance of the duplication of events or conversations which occurs regularly in biblical narrative, but it also reflects the repetition and duplication of situations in life as we live it. It can happen that we seek reassurance not once but many times, or give the same reassurances more than once, more than twice. A person’s life is not just a straight line of narrative, but circles back on itself in loops of memory, repetition and recurrence; likewise the lives depicted in the bible. Joseph and his brothers survive to a good old age, yet it seems that Joseph is the first to die, as, on his deathbed, he addresses his older brothers, telling them that God will bring them up from Egypt to the land promised to Abraham, Isaac and Jacob. Lastly he speaks to his extended family, the children of Israel, saying that when that time comes, they should take his bones and bring them home. 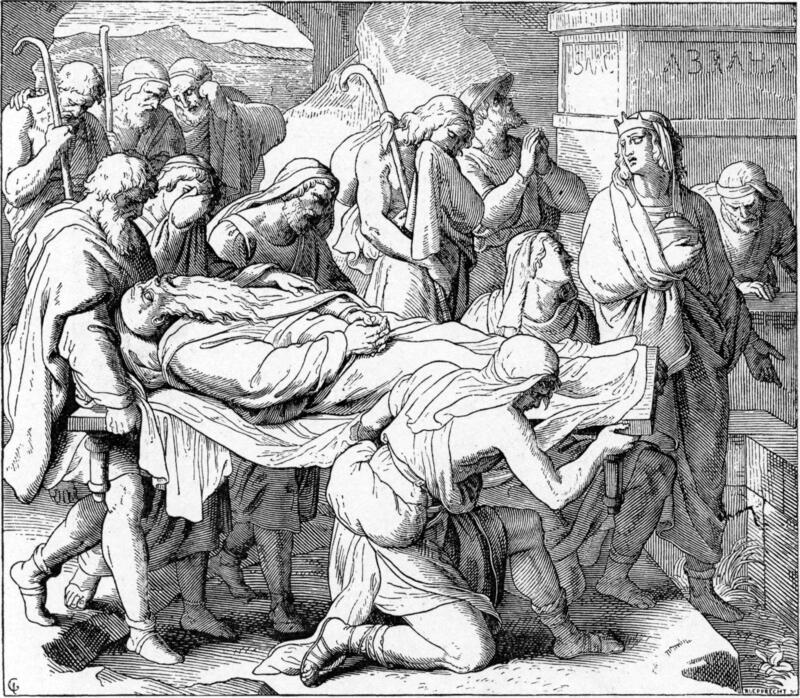 The final sentence of the book of Genesis tells us that Joseph dies at the age of a hundred and ten, is embalmed and put in a coffin in Egypt. Why did he not live to a hundred and twenty? The biblical scholar Robert Alter explains that a hundred and ten was the ideal Egyptian life span. Egyptian as well as Hebraic traditions pervade Joseph’s story. The Egyptian setting will dominate the next book of the Torah: Exodus. Genesis ends with a coffin, Joseph’s, for coffins were part of the elaborate burial practice of the Egyptians. The Hebrew word for coffin is aron, meaning box, the same word we use for the Holy Ark. Robert Alter points out in his commentary on the Pentateuch, that the Exodus story begins with an ark: the cradle of bulrushes which carries the infant Moses downriver. (R Alter on Gen 50:26). This cradle is called tevah in Hebrew, the same word used of Noah’s Ark, the ultimate vehicle of survival and regeneration, and it seems suitable for Moses, who is destined to lead the Israelites out of slavery. As the Israelites depart Egypt, Moses remembers the promise to Joseph and takes with him Joseph’s bones. It falls to a direct descendant of Joseph, Joshua the Ephraimite, to supervise the interment of Joseph’s bones in a piece of land purchased by Jacob from Hamor the father of Shechem, before Joseph was sold into slavery.